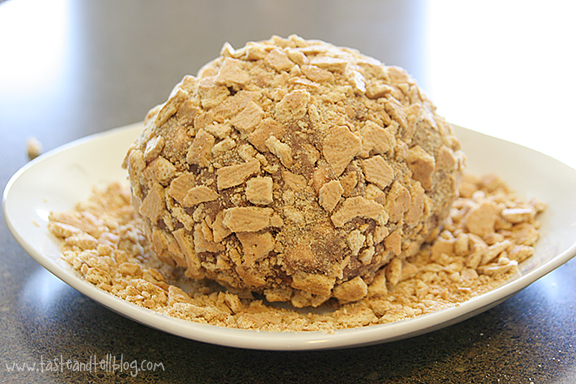 One of my most popular posts to date is the Red Velvet Cheese Ball that I made back in February. And ever since I made it, the wheels in my brain have been turning with different flavor combinations that could be made just as easily. And now I’m only sad that it has taken me this long to actually try a different version. 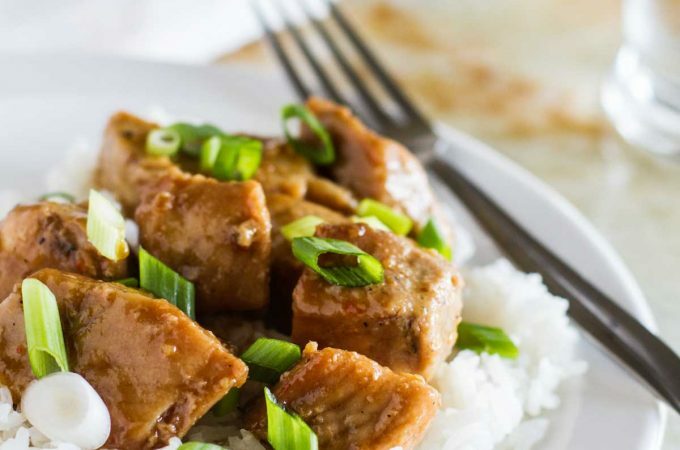 Because really, this is one of the easiest recipes ever. No baking, (yay for summer! ), and very little hands on time. I used my gorgeous KitchenAid stand mixer, but you could seriously just mix this by hand. The flavor combination that kept popping to the forefront of my mind was s’mores. S’mores are all the rage these days – and it’s understandable. What could be better than chocolate, graham crackers and marshmallow? 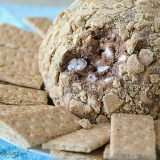 This S’mores Cheese Ball has all of those flavors – presented in a way that would be perfect for summer entertaining. 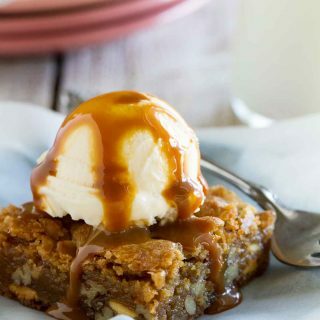 I can imagine that this would be the hit of the dessert table at your next backyard bbq. I did some step-by-step photos for you to show you just how easy this is to throw together. The ingredients are similar to the Red Velvet Cheese Ball, but substituting chocolate cake mix for the red velvet cake mix. You’ll also need mini marshmallows, and of course, graham crackers. Mix together the cake mix, cream cheese, butter, powdered sugar and brown sugar. 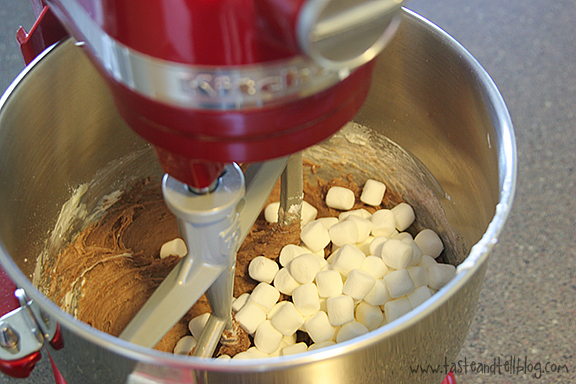 Then mix in the marshmallows until they are evenly distributed and combined. 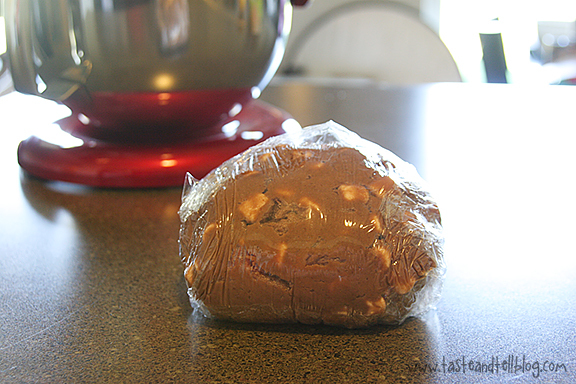 Lay a piece of plastic wrap on your counter, and plop the whole ball of mixture onto it. You don’t even have to touch it and get your hands dirty! Use the plastic wrap and wrap the whole thing up into a ball. It doesn’t need to be perfect – as you can see, mine is not exactly a round ball, but it still works! You’ll need to throw it in the fridge at this point, and let it set up for at least 2 hours. When the ball has chilled, take your graham crackers and roughly crush them up and place them on a small plate. You can go crazier than I did and completely crush them into crumbs, but I wanted to keep it a bit chunkier and more rustic. Take your cheeseball out of the plastic wrap and roll it in the crumbs. Use your hands if you need to to get the crumbs to stick all over. Place the cheese ball on a clean plate and surround with more graham crackers. Easy, peasy!! And better than delicious. I haven’t even been craving sweets, but I couldn’t stay away from this!! 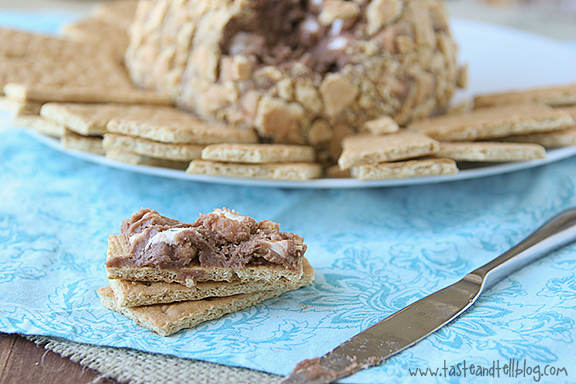 The flavors of s’mores come together in an easy dessert cheese ball. In the bowl of a stand mixer, beat the cream cheese and butter until smooth. Add in the cake mix, the brown sugar and the powdered sugar. Beat until smooth and combined. 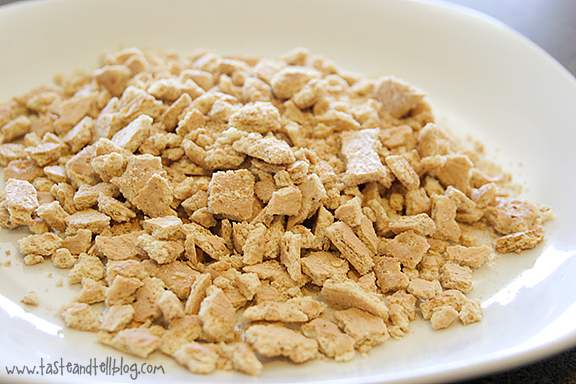 Put the crushed graham crackers on a plate or in a shallow dish. Remove the cheese ball from the refrigerator and unwrap. Roll in the graham crackers. Place on a serving plate and serve with more graham crackers. Want more sweet cheese balls? Whoa. This is intense! Yum! Oh this is just genious!! Are you kidding me with this? 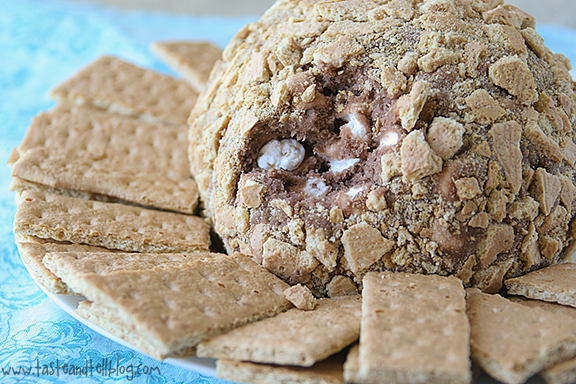 Did you really just put s’mores in a cheeseball? 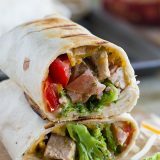 Sounds awesome – I may be making this SOON! This cheeseball is amazing, Deborah. I love the crushed graham crackers on the outside. So extremely creative!! Love the crushed graham coating, brilliant! GREAT BALLS OF FIRE!! er… cheese? chocolate? marshmallows? 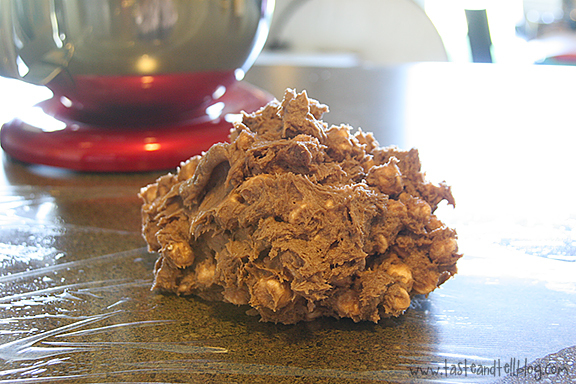 I used your Red Velvet Ball as a launch point for my own version – a Nutella Cream Cheese Ball! It was divine! 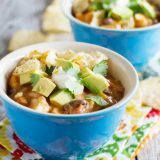 Thanks for the inspiration 🙂 This looks equally as scrumptious! I have to say I had no idea what you meant by a smores cheeseball but now i know I am going to try it! 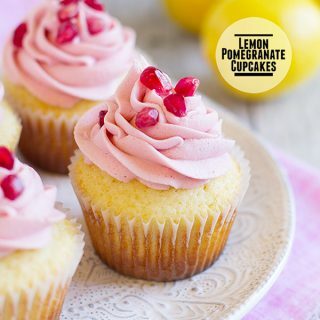 I am all about easy peasy desserts! Thanks!! Oh my gosh, that looks like so much fun!!!! What a fun idea! What a fun cheese call. I pinned it! 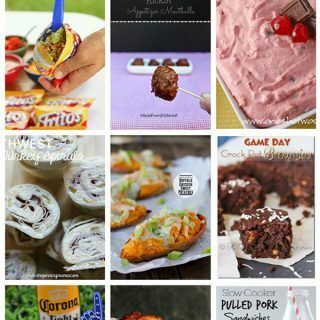 This is perfect for the kids’ bday BBQ this summer! I’ve always been a huge fan of s’mores 🙂 I am quite certain I wouldn’t be able to resist this! I have such a soft spot for anything smore’ish! 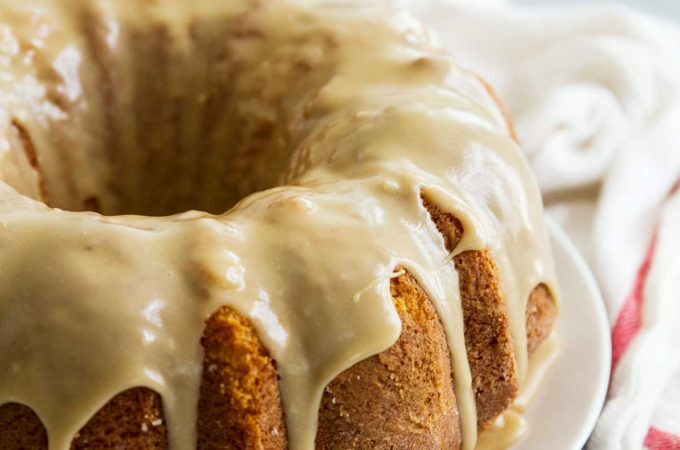 This probably won’t even make it out of my kitchen, let alone to my next bbq dessert table! Amazing! Brilliant! I have been seriously craving s’mores and this looks like it would hit the spot. Love this! I need to make this. I wonder how it would work with chocolate cream cheese…….. I must find out. 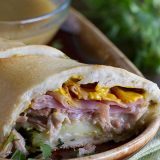 Looks incredibly delicious! Deborah, this looks TO DIE for! I’ve seen the peanut butter ball all over interest… with peanut butter and chocolate chips but S’MORES? So creative! I just love it. Especially for summertime! I loved your red velvet cheese ball and I love this one even more (self proclaimed s’mores freak hear!!)! 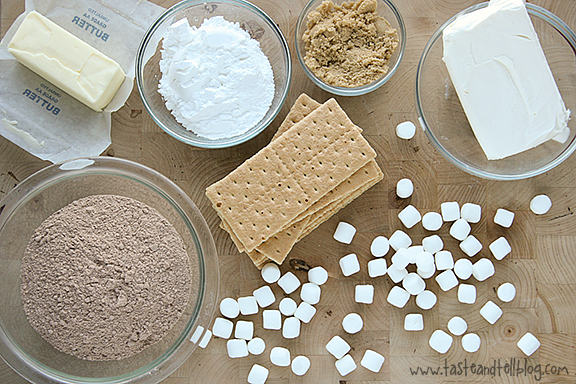 I think I am going to have to whip this up and feature it as part of my 2nd annual s’mores week, coming in a few weeks! 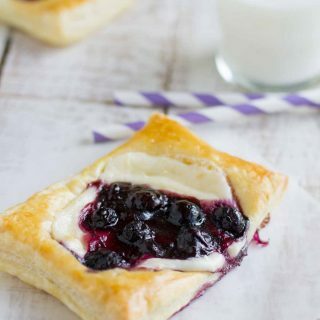 Making this for a get-together today. Can’t wait to try it! Made this and it was WAY too sweet and even my husband who likes things 10 times as sweet as I do agreed. The marshmallows also made the cheeseball very hard to get a portion of and place on the graham crackers. Going to be making the red velvet cheeseball recipe for Valentine’s Day and I hope that the marshmallows were the issue but seriously contemplating cutting the powdered sugar amount in half or completely out? Does anyone know if you can freeze this? My son’s first birthday party is this coming weekend and I’m trying to make as much stuff ahead of time as possible! I haven’t tried freezing it, so I’m not exactly sure how it would turn out. I would probably freeze it without adding the graham crackers, and then just roll the ball before serving. If you do try it, let me know how it turns out! A co-worker made this and everyone raved over it. Another co-worker made it a couple weeks later for us to have again at work! Delish!